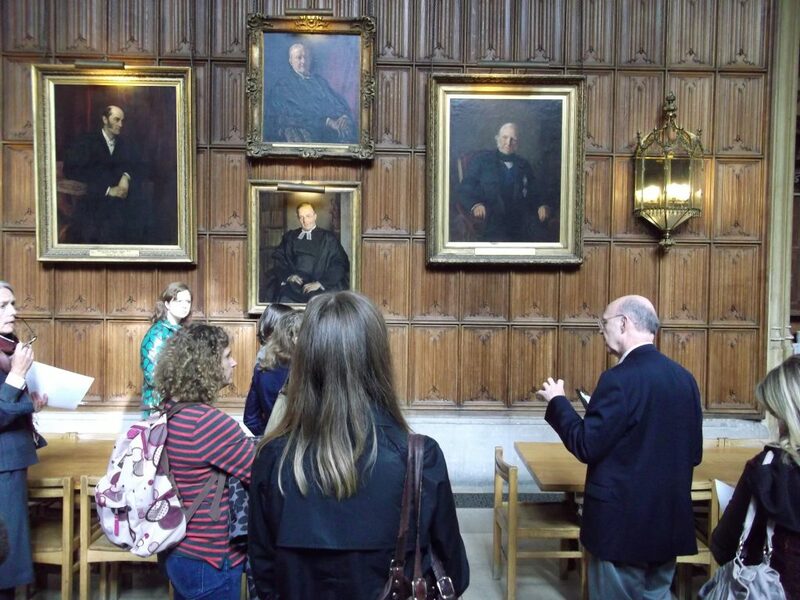 Twenty delegates attended this expert-led series of tours taking in the portrait collections at four Cambridge colleges. We are grateful to Dr Polly Blakesley (Pembroke); Peter Jones (King’s); Sarah Greaves (Murray Edwards); and Paul Simm (Trinity) for providing rare access to their colleges, and for sharing their in-depth knowledge of their collections. Please see the programme below for more details of this event and the venues visited. The third oldest college at the University of Cambridge, Pembroke was founded in 1347, and has a collection of portraits which spans the 600-odd years of its existence. The majority of these depict figures with some connection to the college, ranging from the its foundress, Marie de St Pol (c.1304–77), Countess of Pembroke, to the Nobel Prize winner Sir John Sulston (b.1942). They include portraits by artists as notable as Sir Joshua Reynolds (1723–92) and Tom Phillips, RA (b.1937). The King’s College collection comprises portraits dating from the sixteenth-century to the present day, though most were acquired from the eighteenth-century onwards. The collection has grown through commissions, bequests and purchases, and portraits represent different groups associated with the College such as Provosts, Fellows, Alumni and benefactors. Poets Edmund Waller (1606–87) and Rupert Brooke (1887–1915) and statesmen Sir Francis Walsingham (c.1532–90) and Sir Robert Walpole (1676–1745) are among the many sitters. Delegates will be able to view a portion of the King’s collection, including works by John Riley, Reynolds, Beach, Dance, Herkomer, Rothenstein and Hockney. The New Hall Art Collection, consisting solely of work by women artists, has evolved through gifts and loans since 1986.It is a growing body of approximately 400 works and is the most significant collection of its kind in Europe.The works are displayed in the Grade II* surroundings of Murray Edwards College (Chamberlain, Powell & Bon, 1960).The Collection is of international, national and regional interest as a base for the study of works by women, enabling viewers to trace movements in art in a variety of media over more than 50 years, a period during which women have achieved unprecedented prominence in the visual arts.Prestigious artists such as Maggi Hambling CBE, Dame Paula Rego and Judy Chicago have donated works. The Trinity College art collection is comprised mainly of portraits and is the product of gifts from Masters, Fellows and alumni of the College and of commissions and purchases by the College itself. Assembled over a period of some 470 years it numbers some 240 pictures in oil. The portraits date from about 1535 to the present day and, with their themes of religion, law, government and intellectual eminence, reflect the social and academic history of the College and country. The artists include Dance, Eworth, Gheeraerts, Herkomer, Kneller, Lawrence, Opie, Reynolds, Romney, Vandyke and Watts. The group will be able to see a section of the College collection in the Hall and Old Combination Room.